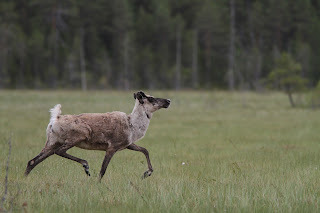 Reindeer Rangifer tarandus (called Caribou in North America) are often easy to see in the Arctic areas of Eurasia and Canada. But many of the animals encountered are not truly wild, though they wander freely for much of the year they are actually owned by people and "farmed" for their meat, milk and hide. But in some areas real wild-living reindeer do exist. For example, in Finland some populations inhabit boreal coniferous forest and rarely venture out onto the open Tundra. These are on average smaller beats and referred to a Forest Reindeer. Photo Kari Kemppainen, Karalia, Finland.